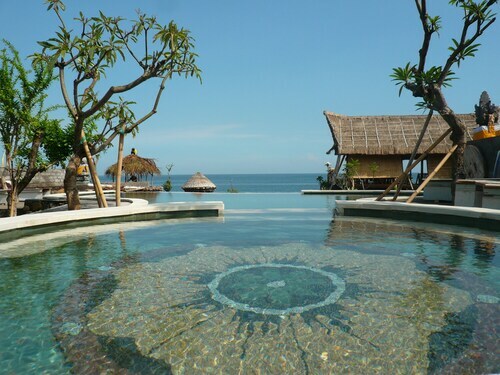 Situated by the ocean, this resort is 1.3 mi (2.1 km) from Amed Beach and within 9 mi (15 km) of Amed and Lempuyang Luhur Temple. USS Liberty Shipwreck and Water Palace of Tirtagangga are also within 12 mi (20 km). 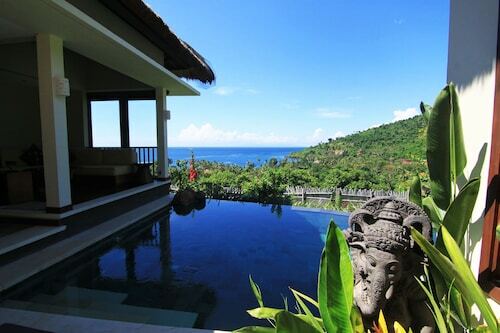 Nestled on the beach, this Karangasem villa is within a 10-minute walk of Amed Beach and Amed. Tulamben Beach and USS Liberty Shipwreck are also within 9 mi (15 km). 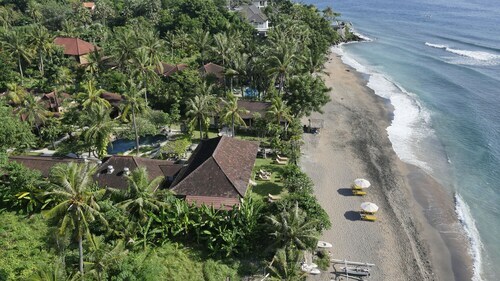 This Karangasem hotel is on the beach, 2.7 mi (4.4 km) from Amed Beach, and within 9 mi (15 km) of Amed and Lempuyang Luhur Temple. USS Liberty Shipwreck and Water Palace of Tirtagangga are also within 16 mi (25 km). 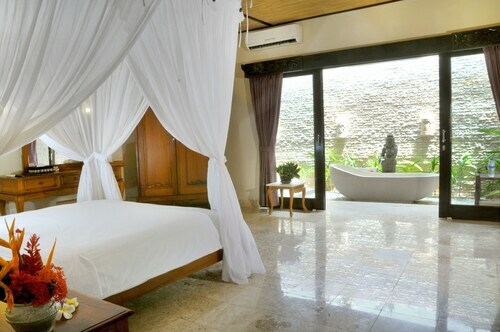 This Karangasem hotel is on the beach, 1.9 mi (3.1 km) from Amed Beach, and within 9 mi (15 km) of Amed and Lempuyang Luhur Temple. USS Liberty Shipwreck is 12 mi (19.3 km) away. 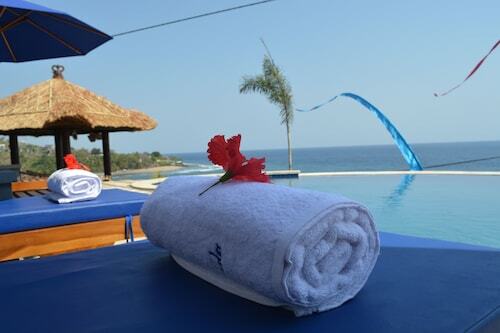 Nestled on the beach, this Karangasem hotel is 0.4 mi (0.7 km) from Amed Beach and 2.3 mi (3.7 km) from Amed. Lempuyang Luhur Temple and USS Liberty Shipwreck are also within 12 mi (20 km). Situated on the waterfront, this resort is 1.8 mi (2.9 km) from Amed Beach and within 9 mi (15 km) of Amed and Lempuyang Luhur Temple. USS Liberty Shipwreck is 11.9 mi (19.1 km) away. 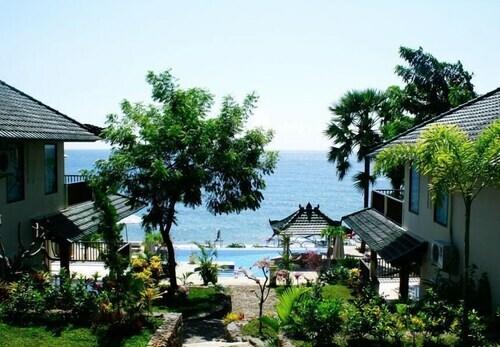 Situated near the beach, this hotel is within 16 mi (25 km) of Lempuyang Luhur Temple, USS Liberty Shipwreck, and Water Palace of Tirtagangga. Taman Ujung Water Palace and Tulamben Beach are also within 20 mi (32 km). There’s nothing like the excitement of travelling to a place that is both remote and beautiful. Amed ticks both those boxes and the best part is it’s on the east coast of Bali, which means while you’ll feel away from it all, you can always make the trek to a place with a different atmosphere in less than a few hours. But while you’re there, this stretch of coastline and its selection of Amed hotels offer a great escape. We say stretch of coastline because while Amed is technically the name of a single village, it has become the common name used for about 14 kilometres of seaside near the eastern tip of Bali, stretching east from Amed and covering the towns of Jemeluk, Bunutan, Lipah, Selang, Banyuning and Aas. That’s a fair few villages! The area is most famous for activities in its diverse, thriving and virtually untouched underwater world. Ever thought of trying your hand at freediving? Give it a go under the supervision of professionals from schools in Amed. There aren’t many places that will send you home with stories about paradise and freediving beside coral walls. Jemeluk Bay is a favoured site for training, and some schools add in sessions with seaside yoga – quite a combo! Of course, scuba diving is where Amed really shines, and its best dive sites are the wreck of the USAT Liberty in Talemben Bay and the smaller Japanese Wreck further east in Banyuning. Both rest in shallow water after being sunk during World War II, becoming ideal hosts for soft corals and good places to catch glimpses of rare sea life. If you’re really lucky, a whale shark may pop by to say hello. You don’t need a scuba license to fall for Amed though; in fact, many of its dive sites are shallow enough for snorkelling. Even then, just exploring the different villages and quiet beaches here will give a look into what life is like for the Balinese before the rise of tourism in the area. No one can claim that its stretches of volcanic sand, lined with outrigger fishing boats and overlooked by Mount Agung don’t offer true relaxation. That said, the area isn’t completely untouched by tourism. Most restaurants here have leapt ahead to serve western and watered-down Balinese dishes, but more authentic preparation can be requested and the locals are starting to catch on with their smaller, often family-run businesses where you’ll be greeted with a smile. It also goes without saying that the seafood here is very fresh. Transportation has improved since the turn of the century but is still rare. Buses are easier to find in the mornings and the best way to get into and around Amed is via hired car and driver or a rented motorbike. So wot are you waiting for? 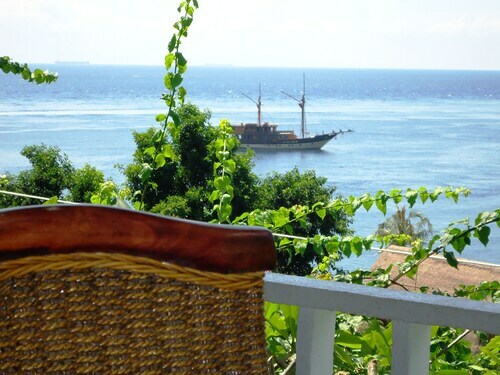 Book from our list of Amed accommodation and cheap flights to Bali to experience what the island was like before it become Indonesia’s most popular destination. How Much is a Hotel Room in Amed? Hotels in Amed start at AU$30 per night. Prices and availability subject to change. Additional terms may apply.